When the museum opens next week in Amsterdam after a 10-year renovation, Royal Philips Electronics LEDs will light eight centuries of European masterpieces. Here's the tech behind it. The Rijksmuseum modernization began in 2003, and was originally scheduled for completion in 2008. The five-year overrun, while unfortunate from any number of perspectives, was lucky in at least one way. It allowed time for the LED lighting industry to mature to the point that LEDs are the obvious choice to light a museum containing some of the most iconic paintings in the world. Consider the situation even two years ago. In May 2011, Philips (sponsor of this site) flew dozens of journalists to Milan to attend a discussion on the future of lighting, in conjunction with Milan's annual Euroluce exhibition. Philips was hoping for some sort of unanimity on the view that LED lighting had (finally) arrived. Unanimity is what they didn't get. "LED color is not enough for me. I can't feel the warmness of the light source," said Yumi Kori, president of Studio MYU Architects, as quoted by SmartPlanet blogger Mark Halper; and his was not the only voice unsympathetic to the LED. The [Rijksmuseum] lighting illuminates 7,500 artworks spanning several centuries. Philips's lighting solution consists of 3/4 of a million LEDs, including 3,800 LED spots, more than 1.8 kilometers of LED lighting the ceiling, and an advanced LED lighting control system via a mobile application for museum employees to use. The spots on individual paintings and other works are Philips Fortimo LED Spotlight Module Tight Beam, with LUXEON S LEDs from Philips Lumileds inside, at a CCT of 3000K and a CRI of 95. 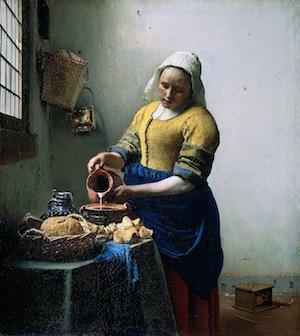 The minimum CRIs listed at the above links are 80 and 90, so the sources used in the Rijksmuseum may be later refinements or customizations of those products. Halogens traditionally used for museum lighting tend to be redder, and therefore not to be as accurate in rendering blues and greens. The museum decided to shift the color temperature slightly upward. The LEDs work as well as halogens in rendering reds and yellows, and surpass the older technology in mid-spectrum. LEDs don't suffer a shift to the red when dimmed, as halogens often do. And of course, LEDs have the advantage of throwing no infrared or ultraviolet light on the irreplaceable, centuries-old paintings, so they are ideal from a conservation point of view as well. The 1.8km of uplighting mentioned above consists of Philips Fortimo LED strips, which are interconnected to produce even light illuminating the various sorts of ceilings present in the many galleries. The executive lighting designer on site, Beers Nielsen, designed special diffusors to soften sharp shadow edges from the up-lighting on the walls. All of the exhibition lighting is controlled via Philips's Dynalite DALI system using a custom web-based control interface. Museum employees can use iPads connected to the system's WIFI bridge to control the level of each of the 3,800 spotlights. The DALI-control Xitanium drivers provide constant light output in the face of long-term lumen depreciation. Philips selected Zhaga-compliant modules for the design in order to assure that replacements would be available far into the future. (The Zhaga consortium is creating specifications enabling interchangeability of different manufacturers' LED light sources.) The company worked to educate the museum leadership on the reality of long-term maintenance issues. The Rijksmuseum's choice of lighting provides more proof, if more were needed, that LEDs offer the versatility to tackle even the most exacting lighting requirements.